Now is the time to finally try making Buttermilk Biscuits from scratch. 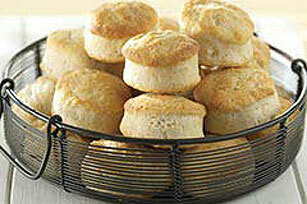 Buttermilk Biscuits are a lot simpler to make at home than you may expect. Mix flour, baking powder, salt, cream of tartar and baking soda in large bowl until well blended. Cut in shortening until mixture resembles coarse crumbs. Add buttermilk; stir with fork until mixture forms a soft dough. Place on lightly floured surface; knead 20 times or until smooth. Pat or roll out dough to 1/2-inch-thickness. Cut into circles with floured 2-inch cookie cutter. Place on ungreased baking sheet. Brush with half of the butter. Bake 12 minutes or until golden brown. Brush with remaining butter. If using 3-inch cookie cutter, you will be able to cut out 7 biscuits. Bake as directed.